Performers include: Jimmy Fallon (host) and Steve Higgins (announcer). Taking over the timeslot from Conan O’Brien, Saturday Night Live alumni Jimmy Fallon hosts this late night talk show. The program opens with The Roots, the show’s house band, playing the theme song and announcing the episode number. Steve Higgens then announces the title of the show, guests, and introduces the host. In typical late night fashion, Fallon performs a topical monologue before moving to comedy sketches that often involve the band and members of the audience. An active participant in social media, Fallon often uses technology in his sketches. The rest of each episode also typically includes a performance by a musical guest as well as interviews with a wide range of notable people and celebrities. The final episode opens with Fallon singing and playing “On a Night Like This” with the Roots and Buckwheat Zydeco. Following his opening monologue, he write thank you notes and celebrities offer advice via a recorded montage. Fallon interviews fellow SNL alumnai Andy Samberg and then Fallon and Higgins recount some of their favorite unexpected moments from their Late Night run. Fallon plays and sings “The Weight” with the Muppets. Once the song is over, Fallon gets up from the drums and walks out of the studio, down the hall, and into his new Tonight Show studio where we hear his crew celebrate his arrival. First aired: February 7, 2014. What do you think? Do you like the Late Night with Jimmy Fallon TV series? 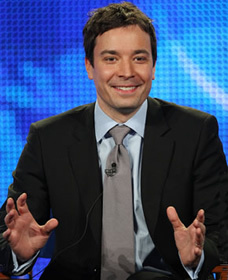 Do you think it should have continued or do you like that Fallon took over The Tonight Show?